The Cushcraft R8 is a vertical antenna for all amateur bands from 40m to 6m. Near the foot of the R8 is a matching network. The antenna has radials and requires no additional counterweight. The R8 was developed to use with a amplifier with this multi-band vertical in limited space. The Cushcraft R9 covers all the amateur bands from 80m to 6m. In addition to the matching network at the base of the antenna, there a some top-load capacity. As a result, this antenna also allows operation on the 80m band. It may be necessary at the band edges or with a transistor amplifier, that you have to use a tuner. As well as the smaller model has the R9 radials to allow a work without additional counterweight. 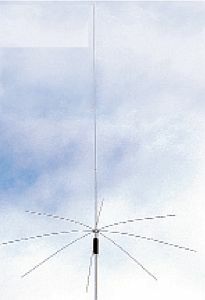 The Cushcraft R600 Vertical antenna covers all the amateur bands from 20m to 6m. Contrary to the other two models, this antenna has no additional capacity. The R6000 has two aditional λ/4 traps for 10m and 15m. The result is lower loss and higher bandwidth on these bands. The bandwidth is 300kHz on 20m, so the use of a tuner at the band edges may be necessary here. The MA-160V is a compact vertical antenna which is designed for DX on Top Band. A deep zero-point ensures that the antenna does not pick up the local QRM. Additionally there is a flat angle of the MA-160V for transmitting. The antenna has a large high-Q copper loading coil that can handle the maximum load of 1500W. An adjustable tuning unit ensures a bandwidth of 40 kHz, which can be freely adjusted between 1.8 and 2.0 MHz. Each antenna comes with a 120m-spool of ground-radial wire plus a Danscord™ insulated guying kit.